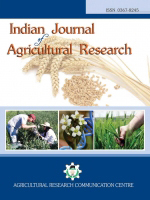 Field experiments were conducted at Tamil Nadu Agricultural University, Coimbatore, during kharif and rabi seasons, 2010-11 to evaluate the influence of System of Crop Intensification (SCI) practices in greengram. Greengram with double seedlings hill-1 maintained at 30 x 10 cm recorded better growth characters viz., plant height (65.20 cm) and drymatter production (4615 kg ha-1) with accelerated physiological attributes like LAI (6.1) and CGR (6.09 g m-2 day-1) than other treatments. Yield attributes like number of clusters hill-1 (8.74) and number of pods hill-1 (75.3) was significantly higher with double seedlings hill-1 maintained at 40 x 40 cm planting geometry than other levels. Whereas, pod length and 100 grain weight were not altered due to SCI practices. Single seedling hill-1 maintained at 25 x 25 cm spacing registered significantly higher grain yield (1408 kg ha-1) and it was at par with double seedlings hill-1 maintained at 30 x 30 cm spacing (1323 kg ha-1) and double seedlings hill-1 with 20 x 20 cm spacing (1309 kg ha-1) compared to others. Haulm yield was the highest under double seedlings hill-1 with 30 x 10 cm spacing (3062 kg ha-1). The highest net return ( 21312) and B:C ratio (2.02) were obtained with single seedling hill-1 maintained at 25 x 25 cm spacing (T2). Crop Geometry, Economic Returns, Grain Yield, Greengram, Number of Seedlings Hill-1.